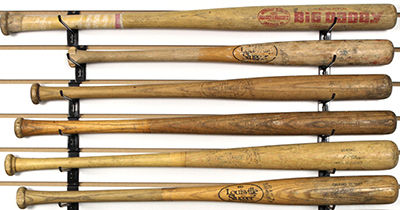 Game-used baseball bats are among the most highly coveted pieces of sports memorabilia. Bats, by their very nature, take a lot of abuse. As a result, each bat leaves evidence that can be used in the authentication process. The older a bat is, the more difficult it is to authenticate. While this can be said for a lot of sports memorabilia, bats are made from wood, an organic compound. They are prone to damage that may result from improper storage. The effects of game use can diminish over time, making once tell-tale markings all but unusable in the authentication process. There are three primary companies in the sports collectibles market that are relied upon for game-used authentication of baseball bats: MeiGray, MEARS and PSA/DNA. Even these experts make the occasional mistake. That's why it’s important that collectors be as self-educated as possible. Are the manufacturer markings correct for the time period in which the bat was purported to be used? Has the bat been altered in anyway? What is the length and weight of the bat? Do those metrics correspond to known examples used by the player? Does the bat display game-used traits specific to the player? Licensed Major League Baseball vendors like Louisville Slugger keep detailed and accurate records. These records date back decades and can be viewed for research purposes. Teams and players place orders that detail the bat's weight, length, wood type and other characteristics. These can be used to validate if a specific make and model of bat was ever ordered and used by a particular player. Game-use indicators can include: ball marks, pine tar presence, taping pattern and player markings like uniform number and initials. If a bat has authentic maker's marks and the presence of game-use traits, even the most seasoned authenticators can provide only an opinion as to whether the bat has been used in a game. All of this criteria is merely circumstantial evidence. The only way to factually determine actual game usage is a signed and witnessed affidavit from the player and detailed photo-matching of the player using the bat. Photo-matching is an important tool used by authenticators. Digital imaging and photo restoration technology have been important advancements in photo-matching. Game-used authentication comes down to an educated guess. There are several resources available to collectors looking to add to or start a game-used bat collection. The following are particularly beneficial when evaluating the authenticity of bats alleged to be used by retired players. With regards to current players or those just recently retired, in 2001, Major League Baseball instituted one of the most comprehensive authentication programs of the four major American sports. The entire process is regulated by an industry leading accounting firm. For a step-by-step guide to MLB’s authentication procedures, visit their website. While some science is involved, game-used bat authentication is still largely an art. There are people in the hobby who have dedicated years to becoming self-made experts. Their opinions are well-respected by some of the country's leading auction houses. Due diligence by the collector is an important part of the authentication process as well. By not merely relying on an expert's opinion, and being educated about the process yourself, the added layer of scrutiny provides an even firmer basis for a piece's authenticity. Ken Reitz 1976 San Francisco Giants Adirondack Game Used Bat Cracked MEARS COA!